Luckily for us, it has never gotten to that third tiebreaker. If rumors are to be believed, there’s a big rule change coming to Jeopardy!. Starting tonight, any ties for first place in regular-play games will be resolved in a tiebreaker, rather than with both (or all three) players keeping their money and returning the next day as co-champions. 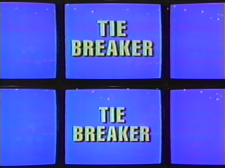 There is only one situation in which wagering for the tie is compulsory: when two players have the same score heading into Final Jeopardy!. Of the seven tiebreakers in tournament play, the two that were warranted had this feature, including the 2014 Teen Tournament Final. Not very often. As of today, there are 3,536 regular games in the J! Archive. Of these, the stars aligned to create the proper conditions for an “unavoidable” tie in just 14. Remember: technically, a tied player has just two options: zero or everything. For this analysis, I am going to disregard zero wagers from a tied player, as only 3 players have used this option in 149 opportunities. This has happened just once. All three players responded correctly, but one – Jeeks Rajagopal – didn’t wager everything. The principle that a tied player should wager either everything or nothing is now known as Jeeks’s Rule. There have been 40 games with two players tied for the lead heading into Final. The only time we should expect to see a tie for first is if both co-leaders respond correctly. There were two additional ties. 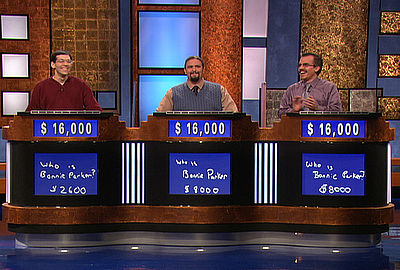 In one, the third player failed to make Final, and both players went for broke and missed, resulting in no winner. The other came from an inappropriately small wager from one co-leader. In 34 games, there was a tie for second place with first still within reach. The only right/wrong combination in which a tie should occur is when (1) the leader misses and (2) both trailers respond correctly. This has happened just 3 times. In fact, the only two ties after players were tied for second heading into Final were a lock-tie (one trailer left off a dollar!) and the Scott Weiss gift. In the lock-tie, the leader responded correctly, so in a tiebreaker situation he probably would have won outright with a non-zero wager. Tiebreakers from these situations should be exceedingly rare – in regular play, the right ingredients come together once every two seasons or so. 40 games total (+1 three-way tie). Both right in 10 games, both wrong in 10 games. 21 were tied in first place with the third player having less than half the leaders’ scores. 25/42 co-leaders wagered everything, while 4/21 trailers (foolishly) wagered everything. In one game, third place had exactly half of the co-leaders’ scores. 18 were “tortoise and the hares” – third has more than half the co-leaders’ scores. 20/36 co-leaders wagered everything; one other wagered zero. 2/18 trailers went all-in, while 4/18 failed to cover a zero wager. 34 non-lock games total; leader responded correctly in 17. In 24 games, the trailers had more than 2/3 of the leader’s score, making either zero or all-in feasible. 21/24 times the leader wagered to cover, always by at least a dollar, but only 16/48 trailers went all-in. A trailer has wagered zero just twice; one got it right but would have lost either way, while the other won on the triple-stumper. In 10 games, the trailers were crushed by the leader. The leader wagered to cover by at least a dollar every time except for the three-way tie and the lock-tie. 10/20 trailers properly wagered everything. One would have received the black mark for not even giving herself a chance to win. Eleanor’s wager in show 4928 was a little unorthodox, but I don’t think it was wrong. It follows the same logic as a zero wager. It’s just slightly suboptimal if the other co-leader goes all-in, but is a very good wager if the other co-leader wagers the same. A zero wager does everything a $2,000 wager does, plus saves her a tie if her opponent wagers the rational zero amount. The point of the all-or-nothing tie-game wager is to optimize expected value. I found the first place tie wagering zero (Game #3970) and one of the two second placers wagering zero (#5218). I’m just having trouble finding the other one. Are you going to update this page as well? Just a thought. Not right, it shouldn’t be changed. It messes up the whole wagering situation in many scenarios. Besides, it’s fun to see a rematch of two co-champions. You never know who will come on top the next game! 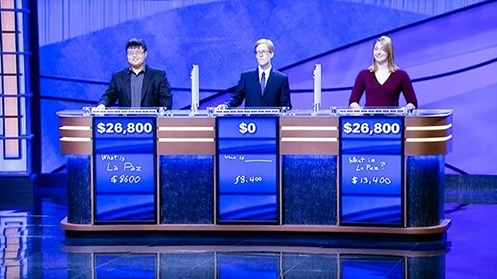 Does anyone know how a two way tie for second and third is determined when they start final Jeopardy with the same amount and end after the final question with the same amount? The leader after the first round takes second. Not sure what the next tiebreaker is.